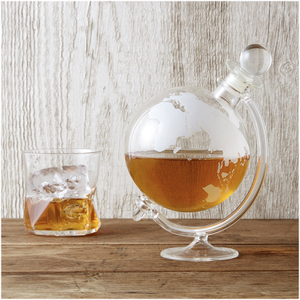 Serve and store your favourite whisky, brandy or spirit from the stunning Mixology Vintage Glass Globe Whisky Decanter. The one-litre capacity glass decanter is decorated with a world map in a silver decal with a miniature glass plane inside the decanter. A wooden stand with a walnut finish is included for gentle revolving while you plan your next exotic trip. Presented in a smart gift box, the decanter will make a great gift idea at any time of year for any travel-loving whisky fan.